Glow slot machine from NetEnt is a title that was originally exclusively produced for the Betsson Group, and features the beautiful northern lights, which gives the game looks very welcoming and atmospheric look and feel. It has 5 reels, 15 paylines, and a max jackpot of 2,000 coins per line. There is also a great free spins bonus round with unlimited free spins, so can result in a huge prize. Read on for all the details in the Glow slot review below. If you’re a fan of the simple functionality of a classic fruit machine but want to experience the enhanced visuals and sound of a modern video slot, look no further than NetEnt’s beautiful Glow slot. 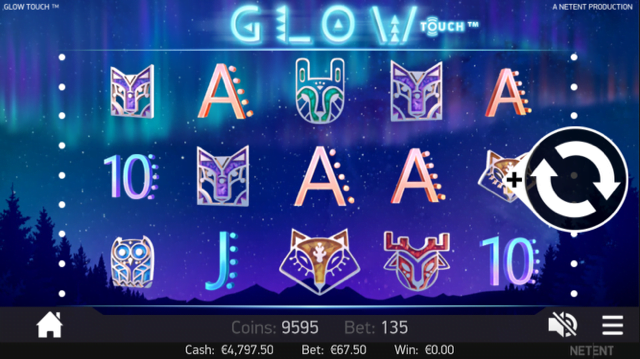 A five-reel, 15-payline title, the Glow slot machine is essentially the same game as Fruit Shop but features graphics and sound that will make it far more appealing to the more discerning player. Inspired by the Northern Lights, the game features a range of animal icons that can be used to trigger anywhere between one and five free spins when they feature in a valid payline and multiplier substitute wilds. Playable for as little as £0.15 per spin across all desktop, mobile and tablet devices, the game boasts a regular jackpot of 2,000x players’ line bet that can rise as high as 8,000x during the bonus feature and a beautifully soothing soundtrack that really is an improvement on its fruit-themed predecessor. Those of you out there who have already played Fruit Shop will know all too well how the free spins in the Glow slot come about, with players receiving up to five bonus games for matching any three-of-a-kind or better animal symbol combination. The number of free spins awarded obviously depends on the value of the triggering combo, but a minimum of two deer symbols will provide at least one game. During the feature, any additional winning spins will result in more bonus games being added to your current total, with the regular ace-through-ten playing card symbols now also triggering between one and five free spins to ensure players can now string together some lengthy sequences. What’s more, all winnings will be subject to a 2x prize multiplier which can also be combined with the regular 2x multiplier wilds, meaning any payline combos can now be worth 4x their stated value, with this boosting the slot’s top award to 8,000x for some substantially enhanced free spin payouts. Let’s make no bones about it; the Glow slot is exactly the same game as Fruit Shop, but the enhanced graphics and sound will at least mean that it appeals to a more modern breed of mobile slots player. Like the Glow slot review? Check out these as well…..